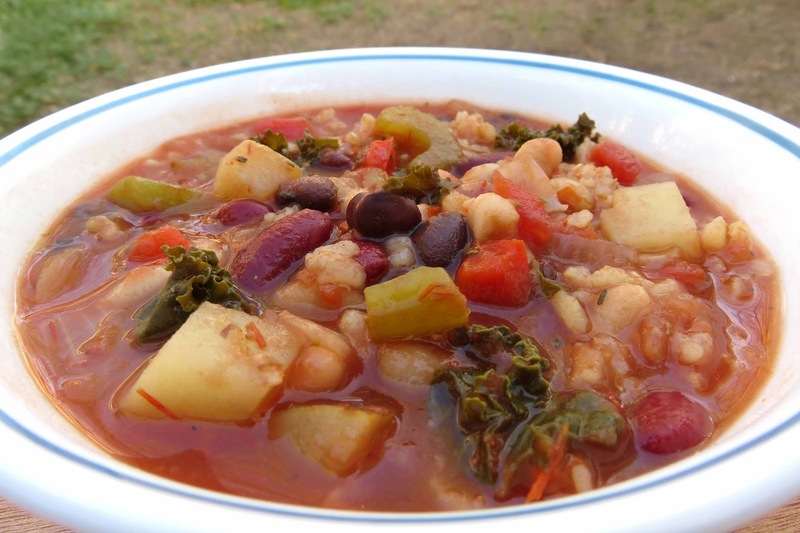 Three kinds of beans, brown rice and potatoes make this minestrone soup extra hearty. In large pot, saute onion, celery, carrots and bell pepper in a small amount of water or vegetable stock for 5 minutes. Stir in garlic and oregano and saute one minute longer. Add remaining water or stock along with the potatoes, tomatoes and rice. Bring to boil, lower heat and simmer 30 minutes. Drain and rinse the beans and add to the soup. Simmer 15 more minutes or until the rice is tender. If using kale, add during the last 5 minutes of cooking. Note: Based on a recipe from Forks Over Knives - The Cookbook which also calls for 2 tablespoons nutritional yeast and 1 cup chopped basil that I leave out and use a chopped bell pepper instead. FOK also suggests 6 cups of cannellini beans, but you can substitute with whatever beans you have on hand.